By Scott Gilfoid: Deontay Wilder has agreed to a unification fight against Anthony Joshua to take place in the UK, and contract will be sent out this week to the WBC champion to sign, according to promoter Eddie Hearn of Matchroom Boxing. Wilder (40-0, 39 KOs) doesn’t mind that he’ll be at a huge disadvantage fighting in the UK. The 6’7” Wilder believes he can take the judges, crowd and referee out of the equation to make sure he doesn’t end up losing like Joshua’s last two opponents Joseph Parker and Wladimir Klitschko. Wilder and his team are so confident of victory that they are willing to agree to the offer, which is likely badly slanted in Joshua’s favor. The thing is, if Wilder, 32, beats Joshua, the money will increase in the rematch for the American heavyweight. He’ll get a far better deal in the rematch, and it’s quite possible that he might be able to get Joshua to come to the U.S for the second fight. Hearn has repeatedly said recently that a deal between Joshua and his WBA mandatory Alexander Povetkin are close to being finalized. However, the fight that Joshua preferred to take is against Wilder, who is viewed as the second best heavyweight in the division by many boxing fans. The soon to be 39-year-old Povekin, 6’2”, isn’t seen as being in the same league as Wilder due to his limited size and advanced age. The negotiations between Team Wilder and Joshua’s promoter Hearn have been ongoing since AJ defeated WBO champion Joseph Parker by a 12 round unanimous decision last March. Hearn’s initial offer to Wilder was an embarrassingly low $12.5 million flat fee, which didn’t include any of the revenue from the gate or pay-per-view. It was simply a $12.5 flat fee and nothing else. The Joshua-Wilder fight is expected to make over $100 million, which means that if Wilder’s team had agreed to the deal, Joshua would make potentially $90+ million compared to Wilder’s $12.5 million. In other words, we’re talking about a 90-10 purse split in favor of Joshua. It was an insane offer by Hearn, who looked amateurish with this offer. That’s the kind of offer you would see from a promoter used to putting together domestic level fights, but not super fights at the world level. 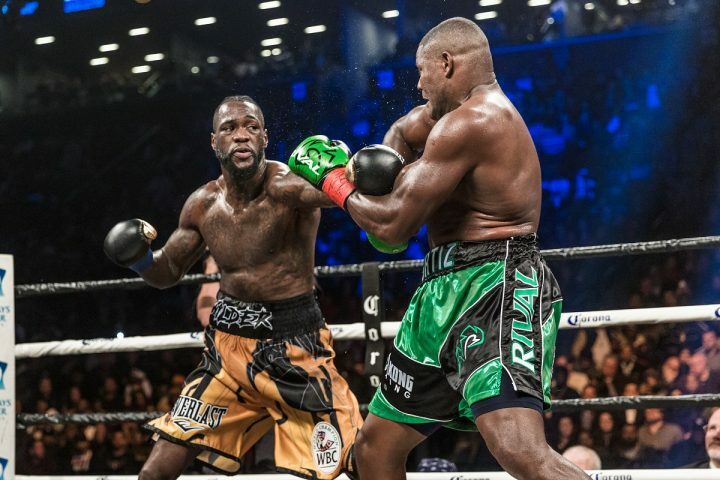 Wilder’s trainer Jay Deas revealed that they accepted a much smaller purse than the $50 million that was offered – and rejected – by Joshua to take the fight. Deas says the Joshua vs. Wilder fight will make far less money in the UK than it would if it took place in the U.S, but they agreed to it anyway due to Deontay wanting to take the fight for his legacy. “They offered and we accepted. We offered $50m, which is what he said he wanted and then he turned it down,” Deas said to AP. “Then they came back with a much, much, much smaller offer for Deontay, which would have been even less than Deontay would have made in the United States, and wanted him to still travel to the UK for the fight. And we said,’ yes,’” Deas said. If Joshua beats Wilder, he’ll be defending against Povetkin next. Joshua wants to win all the heavyweight titles and then defend them for as long as possible. It’s a nice goal for Joshua to have. I’m not sure that he’ll be able to hold onto his heavyweight titles beyond his next fight against Wilder due to the American talent bringing his own judges and referee in the form of his two fists. Joshua has had things his own way fighting in the UK in front of his own boxing fans, who have pulled him through tough fights that he could have lost to Wladimir Klitschko and Carlos Takam. The home crowd has been a huge advantage for Joshua. Likewise, Joshua was helped in his last two fights by the decisions the referees have made in how they officiated his fights against Takam and Parker. The referee prematurely stopped Joshua’s fight against Takam in the 10th round after he slightly stunned the visiting fighter. Takam was not badly hurt, but it didn’t matter. The referee still stopped the contest and gave Joshua a knockout victory. In Joshua’s fight against Parker, the referee prevented Joseph from fighting on the inside by breaking the action continually when he would try and work on the inside. ”He knows that being the undisputed heavyweight champ of the world will give him the financial gain as he proceeds,” Deas said. “Even though we would have liked a better deal, Deontay said, ‘yes,’” Deas continued. There’s a lot of money Wilder can make if he beats Joshua. With AJ’s big ego, he would absolutely insist on a rematch straightaway, and Hearn will likely be fit to be tied, furious at seeing his gravy train ighter lose for the first time. Hearn would know that a rematch would absolutely need to happen for the gold to keep raining on his Matchroom Sport parade.